A tent featured in the NME's Reading Festival review is up for sale on ebay. 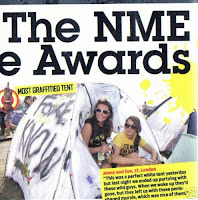 The tent was awarded the "Most graffitied tent" award, though the seller states that the NME completely made up the story (hey, what's new there!). Bidding starts at £2.00 (postage is £9.95). To see details, click here. Saturday 15 September, 12.15am : Bestival, including The Beastie Boys, Madness, Primal Scream and The Gossip (repeated on Sunday night at 12.10am). Saturday 15 September, 1.00am: Snow Patrol from the Isle of Wight Festival. Saturday 22 September, 11.25pm: Foo Fighters at V 2007. A selection of Reading 2007 sets (or partial sets at least) are available to download via the Inieglo blog. The files are linked to Rapidshare, so be quick. There are about ten sets to download, including Ash, Kings of Leon, Razorlight, Maximo Park and The Gossip. Smashing Pumpkins' Reading Festival 2007 set is available for download at the Internet Archive. It appears to be in two parts (one audience, one from a webcast) and is missing the last song. The final UK appearance by Nirvana - at the 1992 Reading Festival is set for release on DVD on September 24. You can pre-order from play.com - click HERE to see details. I don't know yet if this is the full show, or what extras (if any) the DVD will contain. The latest issue of the NME has the results of a reader poll to discover such things as the best festival band of 2007, the longest toilet queue etc. On sale now for £2.10 - the poll can't be any worse than last week's shoddy review of Reading, which (in typical NME style) majored on the sort of over-hyped here-today-gone-tomorrow bands the rag is so keen on. Nine Inch Nails (the band of the weekend) only got a tiny mention. OK, in an attempt to at least try and keep the site up-to-date, the news will now appear in the form of this blog. Let me know (once I've found some news to post) whether you like it or not! Reading 2008 tickets sold out! The advance sale tickets for Reading/Leeds 2008 have sold out in under a week. Don't panic - as usual there'll be another "release" when the main bands are announced next April, and more in early summer.